Since its launch in 2010, Instagram has racked up more than 400 million users, and more than half (59%) of them are on the platform daily—including 35% who visit several times a day. With so many people using the photo-sharing app, there’s a great chance that some of them are interested in your business. If you’re not happy with your current reach, Instagram ads might be your strategy’s missing link. Our beginner’s guide on how to use advertising on Instagram will detail everything you need to know to start your marketing campaign. It’ll also walk you through some of the decisions you’ll need to make when creating your first campaign, and highlight some of the successful ways in which brands have previously used Instagram ads. If you don’t have one already, you’ll need to create an Instagram account in order to advertise on the platform. Because Instagram is a mobile app, you must create your account using your mobile device—not a computer. 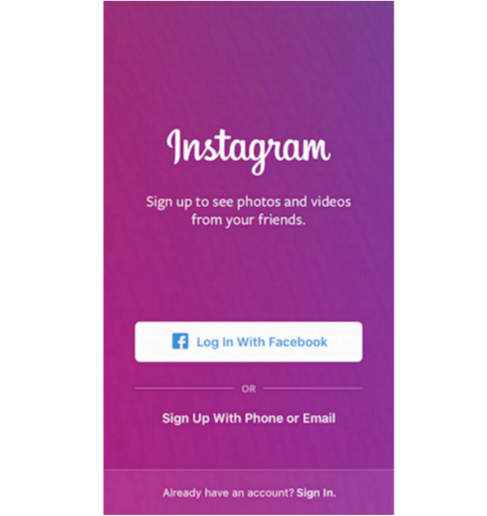 Once you’ve created your account you’ll be able to view Instagram from a computer. Before you start publishing content, be sure to personalize your profile. You’ll be asked to fill out a few important fields, including your name, email address, user name, bio and website. In order to put your best foot forward, check out our tips in How to Write Instagram Bios for Businesses. 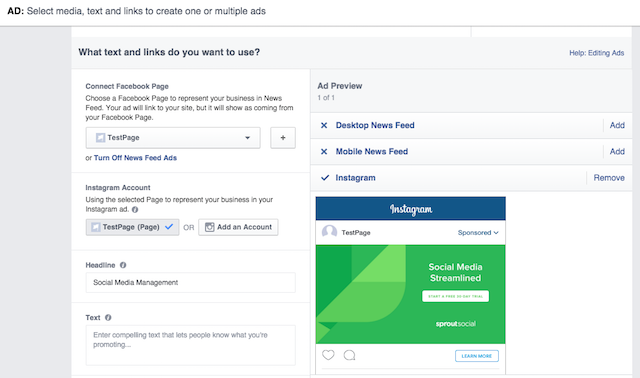 Instagram ads are purchased and managed through Facebook’s self-serve interfaces—Ads Manager and Power Editor—and Marketing API. 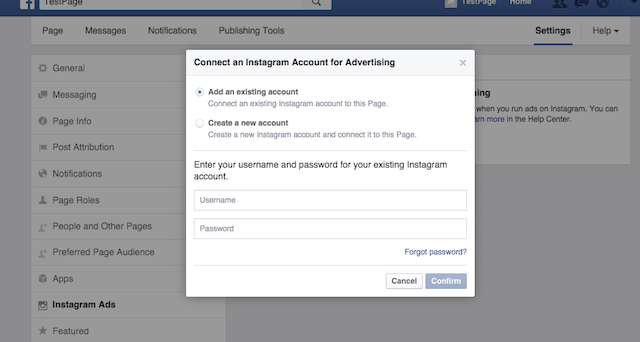 In order to run ads on Instagram, you’ll need a Facebook Page. If you don’t have one, we show you how to set one up here. Go to your Facebook Page and click Settings in the top right corner. Select Instagram Ads from the left column and click on Add an Account. If you have an existing Instagram account, enter your username and password. Otherwise click Create a new account. If you manage multiple Instagram accounts, repeat the steps above to link each one with their corresponding Facebook Page. Each time you create a new campaign on Instagram you’ll have to choose an ad format. You can choose from three different types, and you should do so based on your Instagram objectives—more on these shortly. With photo ads, you can tell your story through vibrant imagery. Whether you’re inspiring people to see your brand in a different light or to take action, Instagram’s photo ads offer you a simple and beautiful way of doing so. A 2015 report from Olapic and L2 stated that photos and stills generated 36% more likes on Instagram. And apparently product posts aren’t deterring engagement—65 of the best performing posts on Instagram displayed a product prominently. But don’t let that statistic stop you from mixing up your subjects. Instagram photos with faces are much more likely—almost 40% more likely—to get likes and comments. If you choose this option, you can use a square or landscape format image. Sometimes the best way to capture and share a moment is through video. Instagram’s video ads offer the same visually immersive quality as photo ads, but take things up a notch by incorporating sound and motion. Similar to photo ads, video creative can appear in the square or landscape format. With carousel ads, you can tell sequenced stories in compelling and meaningful ways. People can swipe to see additional images and a call-to-action button will take them to a website to learn more. It’s a clever way to add more storytelling to your advertising campaigns without the worry of overcrowding the feed or overloading fans with sponsored content. These ads can feature up to five images and are the first of their kind to include clickable (or tappable) links. Previously the only place to insert a clickable link was in your profile. According to Instagram, carousel ads are performing well. On average, they produce an additional 2.5 point lift in ad recall compared to single photo campaigns. French retailer L’Occitane reported 58% higher life in conversion rate. Remember that all Instagram ads will have a Sponsored icon at the top right of the post. Your ad’s caption will appear below the image, video or carousel. With a better understanding how to advertise on Instagram with the previously mentioned ad formats, now it’s time to build your campaign. To get started, go to ad creation on Facebook and choose an objective from the list. Keep in mind that only the following objectives will allow you to create ads that are eligible to appear on Instagram. Page Post Engagement: Increase your content’s reach. Clicks to Website: Send people to specific sections of your website. Website Conversions: Get people to take specific actions on your website. Mobile App Installs: Get people to install your mobile app on their devices. Mobile App Engagement Increase activity on your mobile app. Video Views: Tell a compelling story using video. The rest of the process is very similar to creating Facebook Ads. You’ll set your target audience, schedule and budget details. Let’s take a closer look at each of those sections. The Audience section is where you identify the demographics that matter most to you. You should set aside some time with your team to discuss who your target audience is, and ensure that they’re actually active on Instagram. Location targeting is critical if you’re a local business. With this option, you can target people who live in, recently visited or are currently traveling in a specific location. This is another area you’ll want to discuss with your social media team ahead of time. Once you arrive on this screen, you can choose whether you’d like to set a daily or lifetime amount. These amounts default to $20 and $500, respectively, but you can click on the field to enter a different amount. You’ll also need to set your schedule. You can choose to have your ad run continuously starting the day you create it, or you can set a start and end date. If you choose the latter, you’ll see a confirmation of your start date as well as an estimate for how much you’ll spend during your chosen timeframe. At any time in this section, you can look to the right side of the screen to see your estimated daily reach. 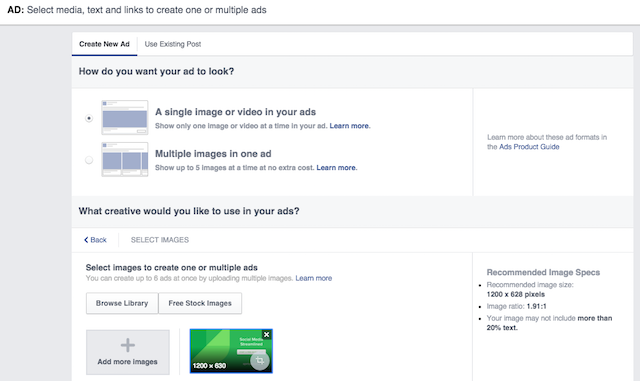 It’ll show you a breakdown for both Facebook and Instagram, but that doesn’t mean you have to run your ad on both platforms. 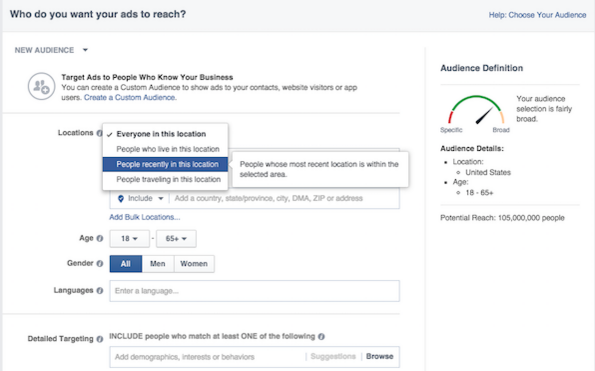 You can choose to run your ad just on Instagram or Instagram and Facebook. The next step is to actually build your ad. For most objectives, you can pick from the three different ad formats we described earlier. Depending on which format you’ve selected, you’ll be asked to upload the photo(s) or video you’d like to use. Below that you should enter the text and links you’d like to include with your ad. Any text entered here should be compelling and descriptive—let people know what you’re promoting and why they should care. But remember to be concise and to let your visual content do most of the talking. And if you’re using a long website address, enter a shorter more web-friendly version in the Display Link box. You’ll be able to preview your ad to the right of the text and link section. To ensure your ad runs on Instagram, make sure there’s a checkmark next to Instagram. If you don’t want to run an ad on Facebook, remove those checkmarks. Once you’re happy with your ad, click Place Order. People are hungry for quality content. Every day 70 million photos are uploaded to Instagram, generating 2.5 billion likes. There’s no reason yours can’t be among those garnering attention. 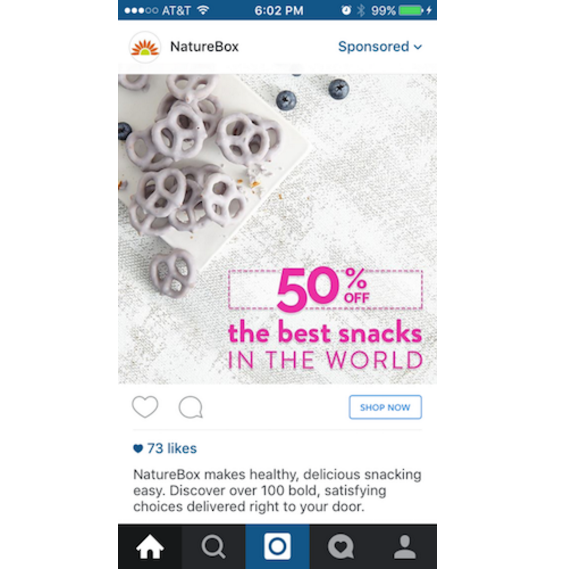 As of July 2015—two years after the launch of Instagram ads—500 ad campaigns have been launched. The company reported 97% of those campaigns created a large increase in brand recall. In fact, the jump was 2.7 times higher compared to to that of the Nielsen control group figures. In order to redefine its brand and reach a younger audience on Instagram, Aeroméxico ran photo ads using the hashtag #viajesquemarcan (memorable trips). The Mexican airline ran nine photo ads, each one featuring a different destination. During its four-week run, the campaign returned a 37 point increase in brand recall—six times higher than Nielsen norms. Here’s a great example of how a global brand used Instagram ads to reach a specific audience. Coca-Cola wanted to reach Indonesia’s mobile-savvy population and used Instagram video ads to do so. The company shared two 15-second video ads, both containing the hashtag #ShareACokeID, that aimed to connect the brand with happiness and friendship. In one month, the campaign boosted message association between the brand, happiness and friendship by seven points. Coca-Cola also saw a 31 point lift in ad recall. To raise awareness for its new RS 3 Sportback, Audi worked with BBH to create compelling stories in a series of Instagram carousel ads. The combination of rich imagery, the exciting RS 3 and interactive carousel ads made the campaign a success. It generated a 36-point lift in ad recall, which is six times higher than the Nielsen norm and 2.3 times higher than Instagram’s ad recall norms. Instagram can be challenging to reach specific audiences, but with the right motivation and steps to follow, you can achieve a lot. These tips can help you get your Instagram ad campaigns up and running. Once you’re receiving the level of response you hoped for, try using an Instagram management tool to monitor, engage, analyze, report and collaborate all your Instagram efforts. Have any insights to how advertising on Instagram has worked for you? Feel free to comment below!